Mario Bros. (Atari, NES and beyond) the first starring Mario title and the debut of Luigi! 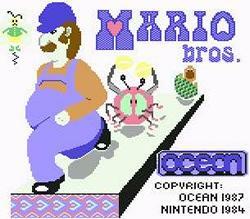 Mario Bros. is a game produced and developed by Nintendo in 1983. It was released on multiple systems (namely: the arcade, NES, Atari 2600, Atari 5200, Atari 7800, Apple II, Commodore 64, FM-7, NESPC88, Amstrad CPC, Atari 8-bit, Game Boy Advance/e-Reader and the Virtual Console (Wii, Wii U, Nintendo 3DS)). Even though many people still don’t consider it as the “first” game in the ultra-popular Mario franchise, its significance is undeniable. First of all, it was the first real game where Mario became Mario as we know him today. You see, long before he started eating mushrooms on a regular basis, long before his epic battles against Bowser and long before Princess Peach became his damsel-in-distress…………long before all that, there was Jumpman. Yeah, you heard us, Jumpman. That was an early prototype of Mario, and that was him actually. He wasn’t a plumber back in 1981 when he made his official debut on the arcades, in the cult classic Donkey Kong. He was an ordinary guy (carpenter) who had to save the girl (called Pauline) from a gigantic King Kong-like monkey called Donkey Kong. The monkey had a lot of barrels and other traps in store for our Jumpman, and he had to outrun all of them (by jumping, obviously), reach Pauline and save her from Donkey Kong. This jumping concept from the Donkey Kong series was an early guidepost towards the overall development of the character of Jumpman. That is why this game is so important. Apart from the notable improvement in the whole concept of how a platform game should look like, this title saw Mario’s first official appearance in the same way as we know him today. Jumpman (from before) got more personality, a new profession, a trademark in form of a moustache and the jumping attribute was further developed and way more personalized – Mario was jumping on and under various blocks, collecting coins and beating various enemies. Of course, since he is a plumber, there were some pipes here and there as well………….Oh, and it wasn’t the first game where Mario made his “official” debut. His brother and side-kick Luigi debuted in this game as well, just like some enemies that later became the standard enemies in the whole franchise as well (like the Koopa Troopas). So, if we could say that Jumpman was an early prototype for the character of Mario, then we can also safely conclude that Mario Bros. was not only a prototype for the original Super Mario Bros. and for the Mario franchise in general……….but also for the entire platform genre and the whole video game industry trends from 1985 and onwards. Needless to say, the game was a huge commercial success. 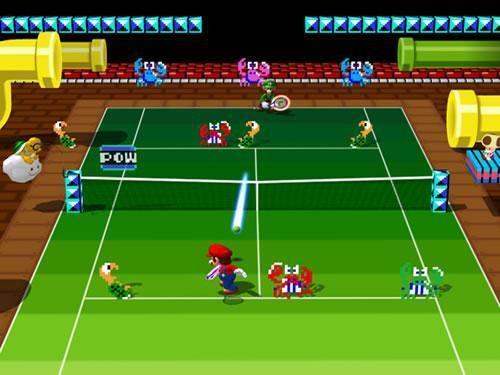 Although it was overshadowed by its (superior) successors, and although there are mixed reactions on various versions of the game, its popularity is undeniable. The fact that it was released on so many different systems and platforms, the fact that it had many different remakes, as well as the fact that it even appeared as part of other games (in form of a mini-game for example)……..all of this just makes this game extremely easy to pick-up and play at any time. Speaking of one of these facts, we should note that the game also appeared as part of the Game & Watch series (though, in a monochromatic form, and utilized on 2 screens), as a minigame with improved visuals in Super Mario Bros. 3, Mario & Luigi: Superstar Saga and all games from the Super Mario Advance series (right here we can see that the original multiplayer mode is further improved and that up to 4 players can play the game at once). The NES version of the game was also ported to the e-Reader (and it was titled: “Mario Bros.-e”). Since the game was, obviously, popular enough, it got sequels as well. Punch Ball Mario Bros. and Mario Bros. Special were developed and released in 1994, and the third sequel (Mario Clash) was released on 1995 for the Virtual Boy. 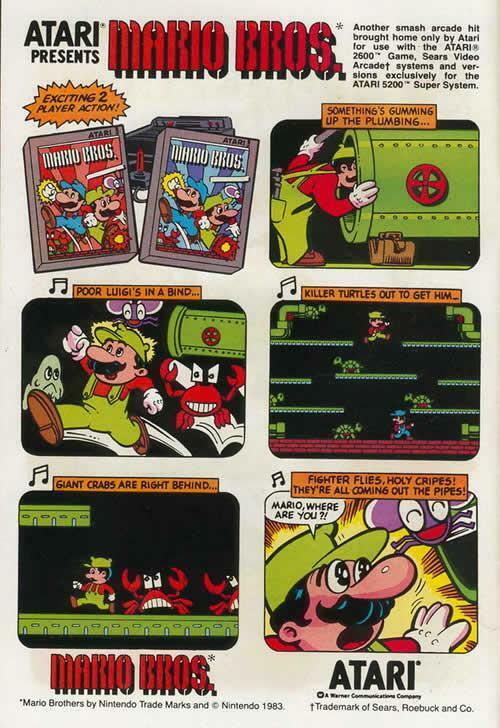 Though, to say the least……….. none of these games were even close to the original Mario Bros.
As we said in the previous section, this was the time period before Mario started battling Bowser in order to save Princess Peach and the Mushroom Kingdom. There was no actual story here – Mario and Luigi are just 2 typical plumbers………ok, well maybe not so typical, but anywaaaay…………they are plumbers and they need to earn some money for living – by working in the sewers (duh!). Things start going in a wrong way when a horde of various different creatures starts invading these sewers, preventing our heroes in performing their regular duties. So, they must beat these enemies and eradicate them from their domain! Those folks need to learn a lesson – never mess with the plumber! Or plumbers………..whatever. 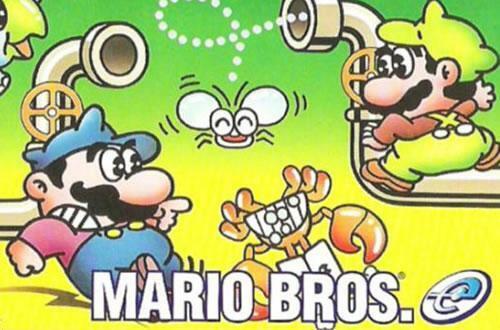 The bros getting accosted by a shell creeper (wow, thats so much more sinister sounding than Koopa Troopa) and a sidestepper crab... while slipping on ice. I seriously hope they were getting danger-premiums in their wages for this job! Seriously though, who lets their sewer get this bad. Just like we said already, this is a platform game and, even though it is not as advanced as its successors, its mechanics are simple, basic and addictive. They involve moving back and forth and jumping on and under the platforms. Those are the basic elements and the other ones are just an upgrade. 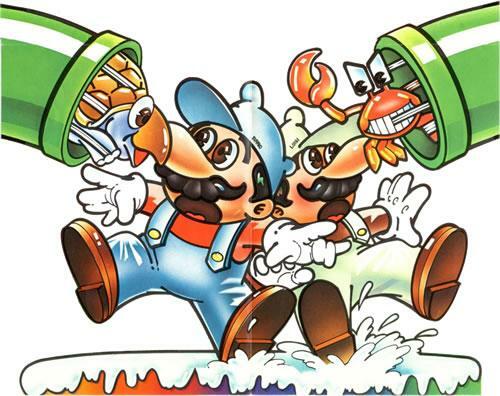 You play as Mario (and/or Luigi in the 2 players mode), and your objective is very clear – to clean the sewers of all the enemies that appear in it. Each level (or phase) has a certain number of enemies that will appear, and as soon as you beat all of them you will get the right to proceed to the next phase. The first phases are not so tricky, but as the game progresses you will face tougher and tougher challenges. Each phase has a different and unique set of static platforms and pipes in it (it is not a side-scrolling platform game, but just a platform game after all) and you will need a lot of jumping and moving around in order to achieve your task. Also, in this early stage, it’s interesting to note that once you walk towards one of the edges of the screen, you will continue walking, but you will “reappear” at the opposite edge automatically and continue from there. So, basically, the levels have no actual boundaries. In order to beat your enemies, you don’t just stomp on their heads and/or shoot them with fireballs like in the future games. Instead, you need to position yourself under the platform on which they are standing on and hit the above block as soon as they get to that point. They will be knocked down for a while and that is your chance to run towards them and kick them off the screen. If you don’t do so in a certain amount of time, the enemies will recover, change colour and increase their speed (however, the last enemy of each phase has a different colour and a faster speed than the others, regardless of other factors). There are different types of enemies (4 of them, in total), and each of them is beaten in a little different way, but the basic premise is the same. As soon as you score enough points (by defeating the enemies and/or picking up the coins that also bring you points, and that appear as soon as you beat each enemy), you will clear the stage and move on, and if the score is high enough, you will have a chance to play a bonus round as well (basically, you have a certain amount of coins scattered throughout the level and there is a time limit to pick them up, so you have to aim to get as many of them as possible). You start with 3 lives just like in Donkey Kong, and as soon as you are touched by an enemy, you die. If you lose all of your lives, you will automatically get a Game Over screen and you will have to start playing all over again. Aside from the regular enemies, there are some fireballs that appear on one side of the screen or the other, and they either move randomly across the screen trying to hurt you, or they move up and down in a “bouncing” pattern from one side of the screen to the other. There are some icicles in the later stages as well, and they are placed under the platforms and they fall down as soon as you get near. These elements all contribute to the game’s overall difficulty. One last element that is very important to be mentioned is the POW block that is located at the bottom of each level. It originally debuted in this game (and reappeared in some of the later installments). Once you hit the POW block from underneath, it will cause an earthquake and knock down all the enemies that appear on the screen at that time (and that are standing on platforms as well). This is a very useful add-on that helps a lot when there’s a lot of enemies on the screen. In this section you can find out more about the only 2 characters that appear in the game (Mario and Luigi). It’s not that you don’t know enough already, but……..every additional information can’t hurt you, can it? Is there really anything to say about him that you don’t know already? This is the actual game where our favourite plumber was born in the way we know him today. Sure, he existed as Jumpman in the first two Donkey Kong games, but look at it this way - we know what happens in the process of giving birth, the foetus is first “conceived” and then born. Our hero was conceived in those 2 games, and the baby was finally born in this game! Needless to say, this baby is healthier than ever! Instead of saving Princess Peach from Bowser, in this game, Mario is located in the sewers and, together with his brother Luigi, he must stop a stampede of various enemies and earn some money to survive. A profession of a plumber is not easy, you know. A true Mario game is not a true Mario game if we don’t have him in it. Mario’s brother and sidekick also makes his first appearance in this game. Since he is also a plumber, he has the same issues like his brother, so in order for all those nasty enemies who appear in the sewers to finally disappear, the two brothers must cooperate and work together to eradicate all of them. People don’t say that nothing is stronger than when two brothers are united for nothing, don’t they? As you already know by now, the goal of this game is to clean the sewers of various nasty creatures who simply don’t belong there. In this section you can see a detailed view of all the enemies that appear in the game, and you can also see what they are doing and how you can beat each of them as well. Shellcreeper – Many will mistake this one for a Koopa Troopa and, well, it’s not that big of a deal, since this is really some sort of its distant cousin. This is a turtle-like enemy that walks back and forth in a slow manner, trying to hurt you. As we already mentioned before, you can’t beat this enemy by stomping on its head. You need to hit it from underneath to knock it on its back, so that you can ultimately kick it off the screen afterwards. Sidestepper – This is an enemy that looks like a red crab and it is everything but friendly. It comes out of the pipes and then starts going from the top all the way to the bottom of the stage. It is a tougher enemy to beat than the Shellcreeper, since you need to hit it 2 times from underneath to flip it over (after you hit it the first time, it will become angry and start going faster, but when you hit it the second time, you will manage to flip it over). After that you can kick it off the screen as usual. Once again, you can’t kill it by stomping on its head. Fighterfly – Since we can agree that there are a lot of pesky and annoying creatures right here, one musn’t be surprised that there are some flies in this game as well. After all, they are some of the most annoying creatures on this planet! Just like the Sidesteppers, these enemies come out of the pipes. Instead of navigating towards the bottom of the screen they move in a “bouncing” manner: up-down, up-down………When they are “up”, they are in the air and when they are “down”, they are standing on a platform. Logically, in order to flip them over, you have to time it right, so that you hit them from underneath when they are touching the platform. If they are in the air, they cannot be harmed in any way (not even with POW blocks). After they are flipped over, you can beat them in the usual way. Slipice – This is probably the toughest enemy in the game, but also different than the regular ones, since you don’t need to beat any of them to clear the stage. As the name implies, it is an ice creature. It navigates along the platforms just like the rest of the enemies, but when it comes to the middle of a platform, it will freeze it completely! Slipice can freeze 3 platforms at a time, so you better kill it before it freezes any of the platforms. As soon as you hit it from underneath you will automatically destroy it, and you will get an award of 500 bonus points. Icicles – This is not a real “enemy”, it is more of a stage hazard, but anyway, since it can hurt you, it surely isn’t your “friend”. They are placed on a ceiling and sometimes on pipes as well, and once you get close, they will fall down in order to kill you. You better watch out and avoid them. Fireballs – Yet another stage hazard. There are 2 types of fireballs in this game – the green ones (that move horizontally from one side of the screen to the other) and the red ones (that move across the entire stage). You can beat them in the same fashion as the Fighterflies – as soon as they touch the platform, hit them from underneath. They can be beaten with a POW block as well. Koopa Troopas – They appear in the Super Mario All-Stars version of the game. They behave in the same way like the Shellcreepers. Spinies – You thought you can get rid of these spiky pests? Well, in case you play a remake of the game in Super Mario Bros. 3, Super Mario Advance series, and Mario & Luigi: Superstar Saga, there is no escape and you will have to deal with them! Boos – They are the standard baddies in the Mario franchise, so yeah……..not even Mario Bros. can end up without it. Just like the Koopa Troopas, they appear in the Super Mario All-Stars version of the game. Bowser – He just had to find a way to make it into this game as well. You were naïve if you thought otherwise. Bowser is seen in the Super Mario Advance series, as well as in the multiplayer Battle Mode of Mario & Luigi: Superstar Saga. This classic was not an exclusive of a single platform and/or system – it was, instead, released on multiple different systems. Along with the arcade version, this game was released in forms of various home versions as well (such as: Apple II, Atari 2600, Atari 5200, Atari 7800, Atari 8-bit, Amstrad CPC and ZX Spectrum). Commodore 64 was packed with 2 different versions: the Atarisoft version (which never saw the light of the day in a commercial form) and the Ocean Software version. It is interesting to note that the Apple II version of the game was, in fact, the only home version that had falling icicles in it. Mario Bros. was also re-released on the Virtual Console for the Wii, Nintendo 3DS and Wii U. It was also remade on the Game Boy Advance, as part of the Super Mario Advance games, as well as Mario & Luigi: Superstar Saga. It was also included as a minigame in the multiplayer mode of Super Mario Bros. 3. There are some indications that we may see a 3D version of this game as well. If this happens, it would be the second release of the game, and it would be released in form of 3D Classics remake, on the Nintendo 3DS. The game would have a camera support, full 3D support and/or analog support. Segments from this release were seen among segments of other games from the NES and the SNES that were meant to be rereleased on the Nintendo 3DS on a tech demo titled: “Classic Games” at E3 2010 in Los Angeles. The NES version of the game appeared as part of furniture in the Nintendo GameCube title Animal Crossing. Even though it wasn’t the only NES game that appeared here, this was the only game that required a Nintendo e-Reader (the add-on for Game Boy Advance) as well as the exclusive Animal Crossing e-Card. This version later came out as part of the NES e-Cards, and it was also re-released via Famicom Mini series (that means that it never came out outside Japan). 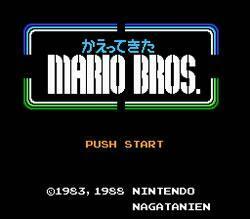 An improved version of the game called Kaette Kita Mario Bros. was released on the Famicom in Japan. It had improvements in both graphics and the gameplay. It also had cutscenes and some Nagatanien advertisements as well (Nagatanien is a Japanese food company). It should be mentioned that this is a very rare game, and it comes as no surprise, since it was only available in a form of a Disk Writer promotion. Another NES version of the game was released as late as 1993. It was named Mario Bros. Classic. This version was a better port than its predecessor and it was much closer to the original arcade version, both in terms of controls and level design as well as the intermissions. 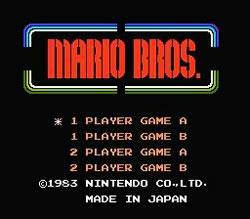 1984 saw two different versions of Mario Bros. being released, and both were made by the same developer (Hudson Soft). 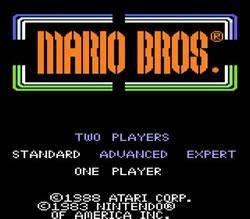 The first game was called Mario Bros. Special and it was basically a classic remake of the original game, only with new elements and with a bit different gameplay. The second game is Punch Ball Mario Bros. which was significant for adding a new concept to the original gameplay (it was an ability to stun your enemies by punching small balls towards them). Both of these games were released for the PC-8801, FM-7 and X1 and both of them were described as average games (they were not the best games in the series, but not the worst either). Mario Bros. got a sequel as well. It was called Mario Clash and it was released in 1995 for the Virtual Boy. 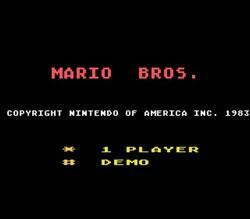 It is actually the first 3D Mario game directly inspired by the original concept of Mario Bros. The goal of this game is to knock off all the enemies on screen in a certain and correct pattern. However, instead of knocking them on their backs by hitting them from underneath like in the Mario Bros. game, in Mario Clash you knock off your enemies by hitting them with Koopa Shells. The Wii U exclusive Super Mario 3D World has Luigi Bros, a remake of the original Mario Bros. where you get to play with Luigi instead of Mario. This feature is unlocked if the console itself contains save files from New Super Luigi U or if you beat Meowser in The Great Tower of Bowser Land in World 8. This game is also a part of the Game & Watch series. However, even though it has the same title, this is a completely different experience than the actual Mario Bros. Instead of doing their plumbing jobs, Mario and Luigi work in a bottling factory and they must prepare and load bottle packages onto a delivery truck. The gameplay is also slightly different. First of all, it is played on two screens (Luigi is controlled on the left screen and Mario on the right). Basically, Mario needs to get the package towards the end of the conveyor belt, so that Luigi can take it and place it on the above conveyer belt, which will return it to Mario……….the process repeats until the package is sealed. After this happens, Luigi needs to carry it into the truck that leaves after it gets filled, which gives you some time to take a break, until it returns ready for new deliveries. It is also interesting to add that the game has no ending. You literally play it until you get bored. Of course, the challenges become tougher and tougher……..but that’s about it. Whatever may be read and/or heard about the NES version, it is safe to say that, while not a perfect port, it is still the closest it could be to the arcade original. It is also the version that majority of us played, at one point or another. The level design is pretty similar to the original version, the frame rate is good, the controls are also good. Some special elements (such as the cut scenes, POW block’s color changing ability, etc…) were left off, and there is something strange in the way Mario looks in this game. While he does have the usual and standard look, he looks a bit overweight in this game. His whole body is disproportional, and he simply looks……..weird. But, when all those things are put aside, this is a good game, very playable, and a pretty decent port of the original game, in our personal opinion. 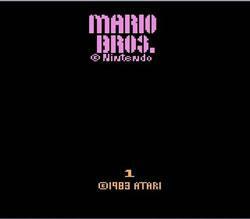 Apart from the official NES game, there is also a Mario Bros. minigame that is a part of Super Mario Bros. 3. It looks similar to the recognizable title, but it is available only in the multiplayer mode of the game (where one player controls Mario and the other one Luigi). Also, instead of the usual objective (clear the stage of all the enemies in order to beat it), this version of Mario Bros. is played in a versus mode, and the player who becomes first to beat 3 or 5 enemies, or the first one to survive - wins the minigame. Another change to the official NES game is that there are Spinies in this version and they replace Shellcreepers. The rest of the enemies are the same. Whatever you may think of this version, it cannot be denied that it is a very interesting add-on to the (already) brilliant game, that Super Mario Bros. 3 definitely is. There were 3 different versions of this game on the Atari systems and this one, logically, is the weakest one. Considering the overall standards of the particular console, this is a “good” game, but it is so much inferior to pretty much every other version that we don’t even know where to start. It is as basic as it can be, which is not a bad thing per se, but the levels just feel monotone, soulless and non-inspirative. Mario looks like he is hand-drawn by somebody who has reeeeally poor drawing skills. And this is the case with other things in this game as well. What was supposed to be a coin, for example, looks like a random blinking square, and what was supposed to be a POW block is just a yellow single line. Not to mention the sound effects that were reasonable for the time (at some point), but nowadays they are just very annoying (for example, when Mario is walking you get to hear something that sounds like a horse that is galloping, and it is very irritating). Generally, for Atari 2600 ( the same console that gave us the infamous E.T. ), this is a good game, but it is a very poor imitation of Mario Bros. on almost every level, so our advice is to avoid it, unless you are a really huge fan of the game. A huge difference compared to the previous version is seen from the first moment when you start playing the game. The graphics are improved, the sound is better, the gameplay is better and the controls feel much more smooth. The characters’ and items’ design is vastly improved and you can now easily differentiate what is what in the game. Sure, it’s not a perfect port and there are flaws (Mario is disproportioned in this game as well, and once again, he looks overweight. His head is rather small compared to the body that is huge. He also doesn’t look like actual Mario at all), but it’s a better game than the Atari 2600 version and definitely a better experience as well. 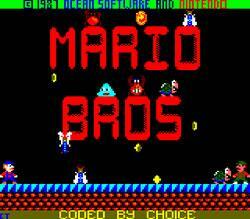 And this is, hands down, the best version of Mario Bros. on Atari. As much as the Atari 5200 version was a huge improvement compared to the 2600 version, this version is a huge improvement over the 5200 version, and a drastic improvement in every single way compared to the 2600 version. This version pretty much got it all right. It has more complexity than the previous 2 games, it has that good old arcade feel to it (it looks and sounds very similar like the original arcade version of the game), the gameplay is fun and challenging, the framerate is also good, the enemies are finally designed in a way they should have been done even in the 2600 version, and Mario finally has the appropriate and familiar look. Our personal opinion is that this is also not only the best version on Atari, but the best non-arcade version as well. It was the closest try to reach the heights of the original. Of course, you are free to disagree. This is a huge step backwards compared to the version that we previously described. While it definitely IS better than the 2600 version, it is worse than the 5200 version and much worse than the 7800 version (at least in our opinion). There are many things that don’t seem right here. For example, Mario and Luigi look extremely weird here. You could barely differentiate and say who is who here. The colors of their outfits are almost identical. Also, they appear to have no moustaches at all! When we speak of a Mario game, and Mario doesn’t have moustaches……..then everything is said. The colors are very messed up. Even the colors of the environment and the enemies are way off. For example, Shellcreepers have yellow (?!) shells in the first level and the pipes are yellow as well, while the color of the bricks at the bottom of the first level is purple. The controls are also quite messy and the sound effects are annoying and disturbing. Unless you really love the game, it would be better to skip this version because, trust us on this, you won’t miss anything. 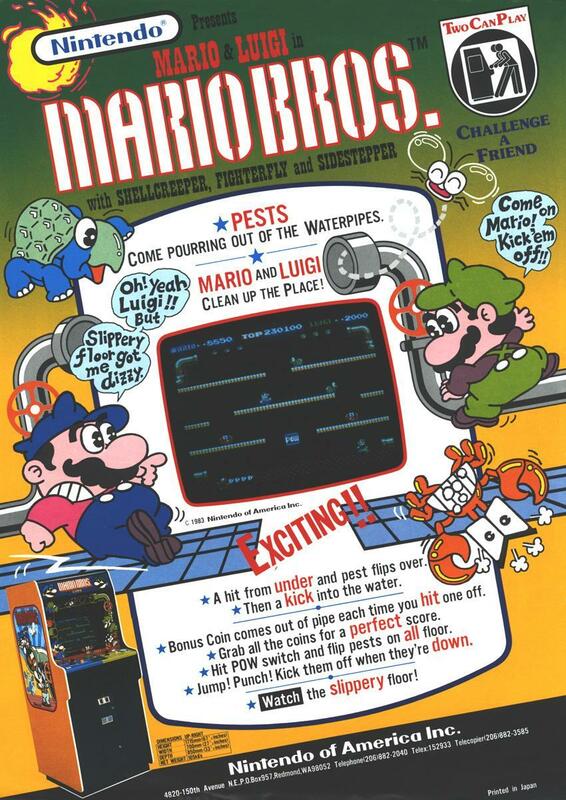 An comic style advertising poster for the Atari version of Mario Bros. Since we are sticking to the console versions , and Commodore 64 isn’t a console, you have all rights to complain about our description of Mario Bros. for Commodore 64. However, it was a very influential sort-of-a console back at the time, just like PC is now, so we’ll make a little exception here. Generally, this is a good port. Even though the colors are also a bit off, just like in the Atari 8-bit version (the pipes are yellow again, for example), the rest of the visuals are spot on. Mario looks a bit weird in this version, but he doesn’t look like an obese grumpy old man like in the NES and the Atari 5200 versions of the game. You can easily differentiate between Mario and Luigi as well. The controls are good, the sounds are also very good, and the POW block is changing colors just like in the arcade original! Hooray! Not the best version of Mario Bros. but a good one, and it is definitely worth a try. On the SNES, you can find a Mario Bros. minigame on the Super Mario All-Stars cartridge, as a Battle Mode in Super Mario Bros. 3. It is the same game like the one we can find in the NES version of SMB 3, but it has updated graphics, updated sprites of Mario and Luigi, a background and improved sound effects as well. The goal is still the same, just like the enemies. There wasn’t a sole Mario Bros. game on the Game Boy Advance, but instead, they came as part of the other games (every game from Super Mario Advance series + Mario & Luigi Superstar Saga). First thing that has to be noted is that, from the technical side, this is the most superior version of the game. The graphics are drastically improved in every possible way, the sound effects are awesome, Mario and Luigi have new sprites (that remind of those from Super Mario Bros. 3), and they have voices as well! Not to mention that levels have backgrounds as well. Still, even though it all looks, sounds and plays really well, we have to say that the old-school flavor of the traditional Mario Bros. game(s) is almost completely lost. This feels like an entirely different experience, even though it is still the same game. However, if you want to play a modern version of Mario Bros. and if you are not a retro gamer (or at least not a REAL retro gamer), you have to try this. Yes, there is even a version for the e-Reader. This is a direct port of the NES version so it is almost completely identical to that version. The only difference is that there are 4 types of Shellcreepers in this game (red, green, yellow and blue) and there is no multiplayer. Everything else is completely the same, so if you like the NES version, you will definetly love this one as well. The newest installment of this game was launched on a Virtual Console (for the Wii, Nintendo 3DS and Wii U). Just like the e-Reader version, this is yet another recycle of an old NES version. This one is actually completely identical, so it retains all the positive and negative aspects of the NES original. So, the only difference here is that you are playing the game on a Virtual Console service and not on the NES. They could have added some variety, couldn’t they? As this was the first huge game where our favorite plumber appeared (and where he made his debut as Mario), it is just obvious that this title has many references in the later releases. We will now mention each and every one of them………..
Super Smash Bros. for Nintendo 3DS/Wii U – Mario’s blue combination is identical to the color scheme that he is wearing in the Japanese artwork of this game. A North American TV commercial from back in 1983 advertising Mario Bros' launch on the Atari 2600 and 5200. The game was very successful and it got many great reviews from both the players and the gaming critics. However, the reactions were, generally, quite mixed in different parts of the world. For example, it was only mildly successful in Japan, mainly because of a certain shortage of arcade cabinets back at the time. Still, the NES version of the game managed to sell more than 1.63 million copies, while the Famicom mini re-release of the same game has sold more than 90 000 copies in this country. Even though it was released in the time period when the North American video game crash of 1983 was happening, this game didn’t suffer any bad consequences because of this fact. Editor Dave Ellis stated that this is one of the more memorable classic games. Opinions on the NES version of the game were mostly mixed as well, but the positive opinions (especially among the players themselves) are dominating here. However, in a review of the Virtual Console version of the game, GameSpot stated that the NES version is only a bad port of the arcade original, and the Virtual Console version itself got a pretty bad review. It was said that not only it is a port of an already badly ported game, but it also has all the technical flaws of its predecessor. The same source also criticizes all ports of this game, in general as well, and adds that this is just one of the many ports that Nintendo has made throughout its long history, and that the game simply doesn’t stand out. On the other hand, IGN gave a lot of compliments about the gameplay of the Virtual Console version of the game, while they also criticized the decision to make an additional port of an inferior Mario Bros. game. They also agreed with GameSpot about the number of different ports of this game. They also added that since many people posses Mario Bros. as part of at least one of the games from the Super Mario Advance series, this version isn’t worth 500 Wii points. The e-Reader version of the game received better critics from IGN. They praised the gameplay, but they also criticized the lack of the multiplayer option and they added that people have no reason to buy it, since they can literally play the same game in either of the Super Mario Advance games. 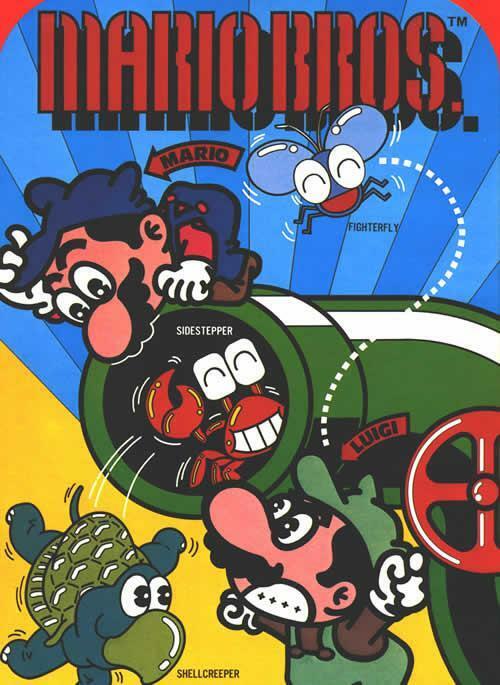 Artwork from the e-Reader version of Mario Bros. The games from the Super Mario Advance series, as well as Mario & Luigi: Superstar Saga were all packed with the same version of this game in them. The game was originally added to the first Super Mario Advance game, and IGN praised this aspect for being simple and fun, but they added that it would have been better if the developers implemented a new and different game instead. IGN’s review of Yoshi’s Island: Super Mario Advance 3 criticizes it even more since the multiplayer option was completely left off in this release. A review of GameSpot on Super Mario Bros. 3: Super Mario Advance 4 states that it is “a throwaway feature that could have simply been gutted”. Other editors were not so critical about it. Even though its use was bashed in many reviews of Super Mario Advance games, a GameSpy review stated that the version that can be played in Super Mario Advance 2 is “a blast to play in multiplayer”, as it involves at least 2 Game Boy Advance consoles, one copy of the game itself and a link cable as well. The NES version of the game managed to sell 2.28 million copies globally. Of that number, 22.5 % (0.51 million) copies were sold in North America, 5.2 % (0.12 million) copies were sold in Europe and 71.5% (1.63 million) copies were sold in Japan. 0.8% (0.02 million) copies were sold in rest of the world. The Atari 2600 version of the game sold 1.59 million copies globally. Of that number, 93.4% (1.48 million) copies were sold in North America, 5.6 % (0.09 million) copies were sold in Europe and 1.0% (0.02 million) copies were sold in rest of the world. This is the first game where Mario appears as Mario (and not as Jumpman), and it is the first game where he got the personality that is familiar even nowadays. It is the game where Mario’s brother Luigi makes his debut appearance. This game is a prototype for all the future Mario games. It is the first game that implemented the concept of jumping on and around the platforms and picking up the coins. It is also the first game that introduced “pipes”. 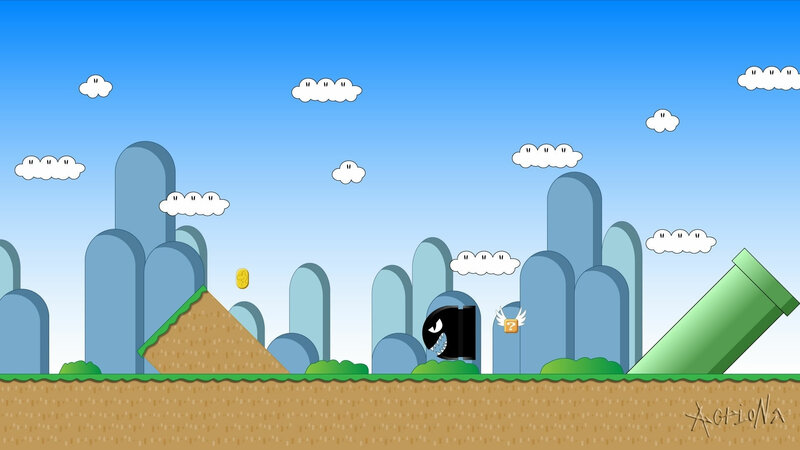 Enemies such as: Shellcreepers, Sidesteppers, Fighter Flies, Slipices, Icicles and Fireballs all made their debuts in this game, respectively. 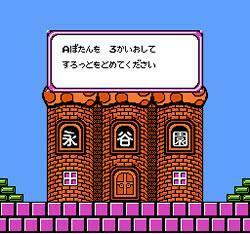 The second stage (Phase 2) was removed from the non-Japanese versions of the game. The music theme that you can hear once you start playing the first level is actually a composition of Mozart (Eine Kleine Nachtmusik). The same theme can be heard in Dance Dance Revolution: Mario Mix as well as Super Smash Bros. Brawl. No home port of this game can actually match the experience that you get while playing the arcade version of it. The closest version to the arcade original is the Classic Series of the game for the NES. That version was released in 1993 and it was based on Kaettekita Mario Bros. (an updated version of Mario Bros. that was released in Japan only). Kaettekita Mario Bros; a direct descendant of Mario Bros, the title roughly translates to "Return of the Mario Bros"